This range of ribbons are for applications which require excellent printing quality on textile materials and require good resistance to washing, ironing and dry-cleaning. They are suitable for most printers with flathead technology, inside or outside wound and available sizes are listed below. RESIN AXR 9 ribbon is engineered for printing onto textile materials – e.g. nylon, polyester and acetates. 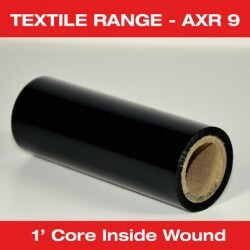 AXR 9 has excellent resistance to washing, ironing and dry-cleaning. Ribbon gives a quality print for small barcodes and text.